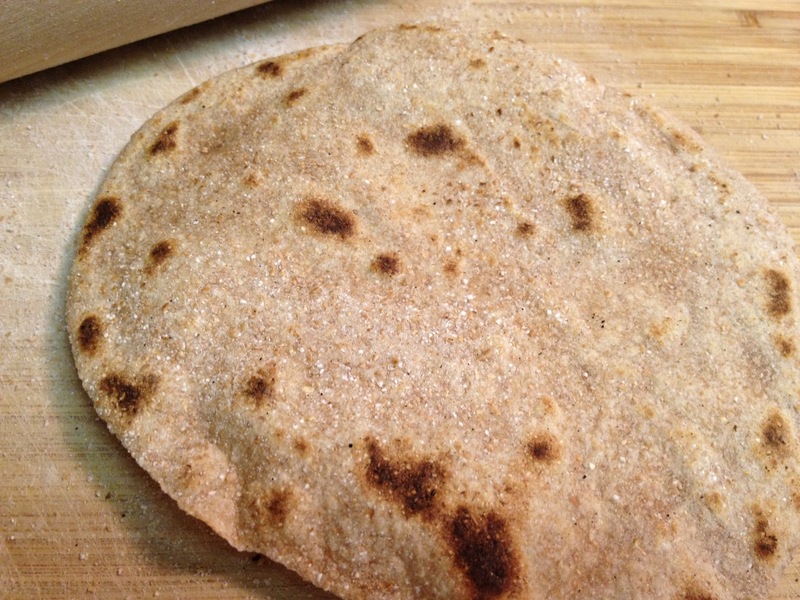 These whole wheat Indian breads are meant for picking delicious Indian foods. This recipe makes 8 chapatis and fun to make with your kids. Luke loved “punching” the dough and rolling out the “pancakes”! Sift flours into a mixing bowl. Add salt. Mix together with a fork. Then add the oil and mix together breaking up the little oil balls with your fingers until the dough is crumbly. Slowly add water until the dough comes together and knead for a few minutes. Cut into 8 sections and roll into balls. Use a rolling pin and roll them out on a floured surface. Drop the chapati onto a hot pan (non-stick skillet or cast iron) and cook the first side until it sort of bubbles up and brown spots appear. Then flip over and do the same on the other.